Wheelchair users can now exercise with ease in a virtual gaming environment, thanks to a UT alumnus. 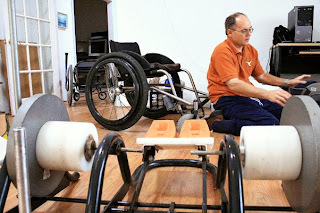 Chris Stanford, (pictured) who has been a wheelchair user for more than 20 years, works with undergraduate engineering students to improve the TrekEase, a treadmill-like machine for manual wheelchair users. Some versions of the device include a virtual environment to make exercising more enjoyable. Stanford is working on a seventh, more cost-efficient prototype. The machine costs nearly $2,000, but Stanford hopes to lower the cost to $500. It has not yet been patented. “The initial goal was to develop a stationary apparatus for military users that was simple and inexpensive,” Stanford said. “But there’s a lot of lip service for the chronically disabled and no action actually taken. If I don’t do it, it will not get done.”The machine can only be used with manual wheelchairs. The motivation behind the device is to de-emphasize the focus on motorized wheelchairs and reduce obesity among the wheelchair-bound, Stanford said. He hopes to have the device eventually covered under insurance plans. Engineering students like Tuan Ta are developing tools to monitor the treadmill users’ performance, including heart rate and number of calories burned. TrekEase stands for Translational and Rotational Equivalent Kinetic Energy Aerobic Stationary Exerciser. Stanford created a corporation with the same name three years ago but the Trek Bicycle Corp. filed a trademark infringement suit against him due to the similarity between the corporations’ names. “This is an example of a large corporation that has nothing better to do,” Stanford said. Stanford said he wrote his own legal brief, with hundreds of pages of documentation, to defend his trademark. Trek Bicycle Corp. attorney Amy Davison said because the dispute is pending, the corporation cannot comment on the issue. She said the dispute could take months to settle. Meanwhile, the TrekEase developing team will continue to work on adding more features, such as an online gaming program.